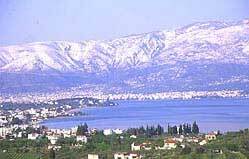 Seaside rural town 5 km before Volos, on the site of ancient Pagases, an eminent commercial center of the 5th century BC and port of ancient Pherae, to which the Pagasetic Gulf owes its name. Nees Pagases is new name of the village of simply Alykes. According to myth, the legendary ship Argo was built here. Part of the wall and tombs of the 3rd century BC still exist. On the hill of Soros, a little further out from Alikes, there are the ancient ruins of the city of Pagases, and the sanctuary of the God Apollo. The endless beach and cool water offer an ideal setting for peaceful holidays.A summer resort today with good facilities for tourists. For those who prefer intense nightlife, the numerous clubs offer this occasion in the summer months.